Pavé crystals and spikes trim open frame. 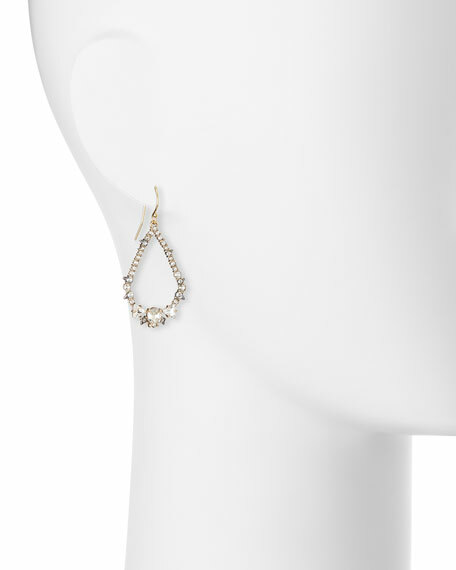 Brustalist cystal encrusted link drop earrings Alexis Bittar. Ruthenium plating and 10-karat gold plating over brass. Two-tone interlocking links with Swarovski® crystals. Post backs for pierced ears. Approx. 3.2"L drop; 1"W. Imported. Crumpled drop earrings by Alexis Bittar. Rhodium plating over brass hardware. Brilliant-cut and pavé clear crystals. Approx. 3.6"L; 1"W. Clip-on backs. Imported. Crystal encrusted plaid drop earrings by Alexis Bittar. Polished silvertone and 10-karat gold plated brass. Open oval drop with crystal pavé and spiky edges. Large ovals with crystal pavé plaid and spikes. French wire for pierced ears. Approx. 3.8"L drop. Imported. Crystal encrusted spiral drop earrings by Alexis Bittar. Silvertone and 10-karat gold plated brass hardware. Spiral drop with clear crystal pavé accents. Prong-set blue labradorite doublet center. French wire for pierced ears. Approx. 1.6"L drop. Imported.